Animals probably don't enjoy stale food any more than us humans do. 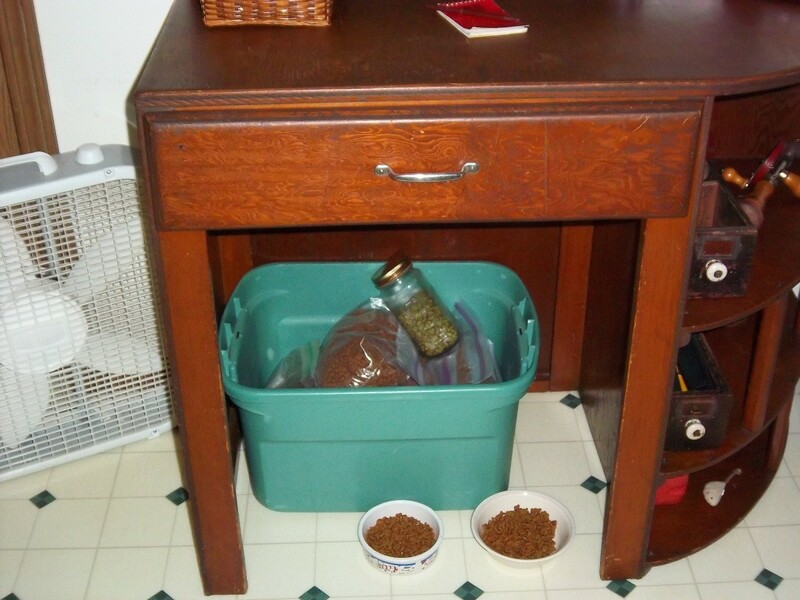 Storing pet food properly will keep the food fresh and keep unwanted pests out. 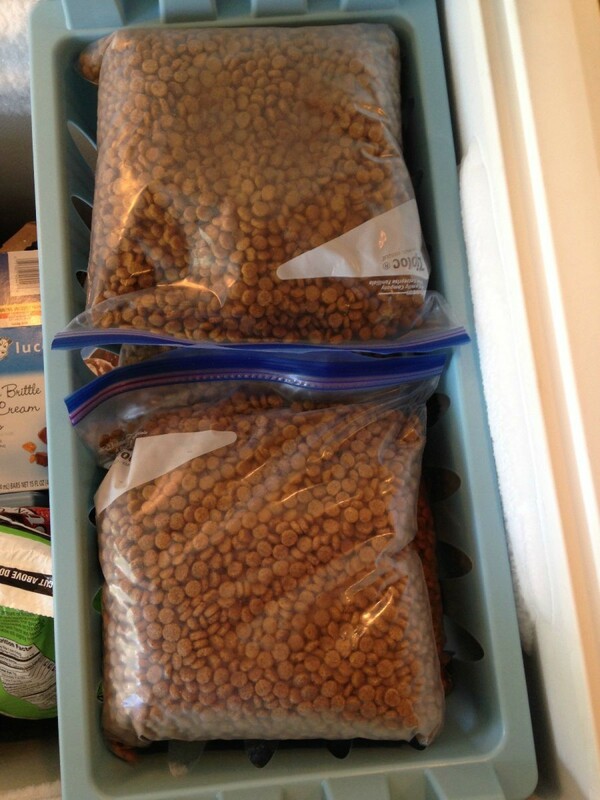 This is a guide to storing pet food. Most national and store brand bean dip lids have the same diameter. So if your family eats this treat on a Friday night, or your neighbor has it at a block party, be sure to save those lids. Once rinsed well, they make perfectly fitting lids for your pet's canned food; saving you $1-2 for a store-bought one. 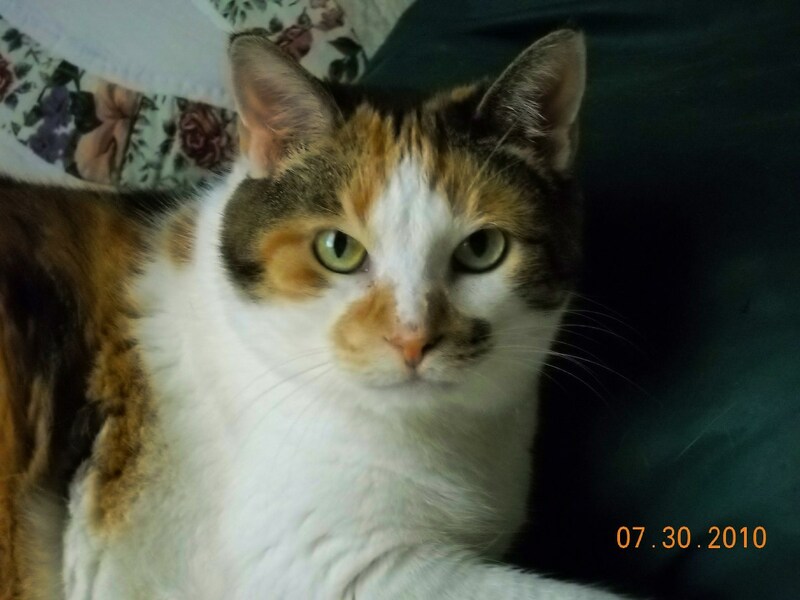 Always remember that if you don't feed your critters canned food, your local SPCA and/or Humane Society does, and they can always use donations. 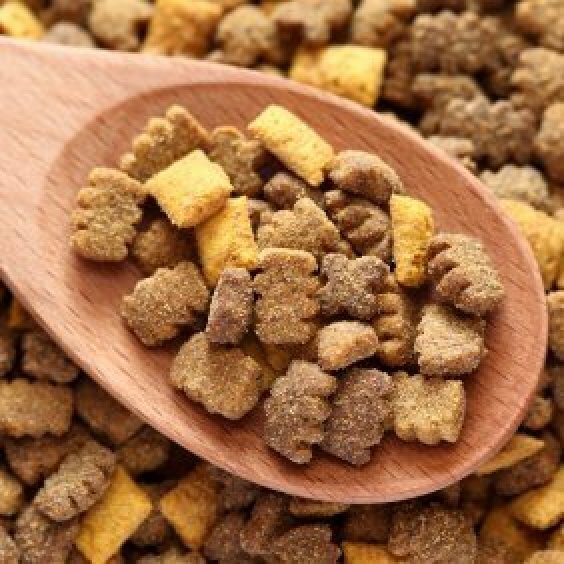 Canned food can seem pricey, but when used in moderation mixed with dry, it can be an affordable treat for you loved furry ones. 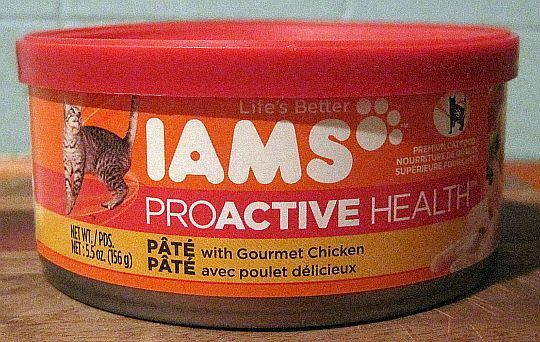 I bought a can of IAMS cat food at Target for $.96. When it was mixed with dry food and the rest kept fresh with a lid and in the fridge, it lasted four meals. I have two kitties on prescription food. It is rather expensive, but there is a noticeable break if you buy the larger bag, 17 lbs. However, my discriminating cats don't eat stale food as reliably as when it is fresh. I bag up the excess and freeze it for future use. I have a variety of pets and needed ideas to keep the food clean and out of the way. For the dogs and cats, I use a big Rubbermaid box with a tight fitting lid. It holds a big bag of food and keeps pests out. If you want to remember what kind of food you bought, you could tape part of the bag inside the lid. For my fish, I keep their little food containers in a basket next to the tank. They are attractively stored and near at hand. A side note here, I move the basket out of reach when little hands come by that might want to feed the fish. I have several birds, and I store their food in a plastic bucket that once held ice cream. I have a small measuring cup that I throw in on top to use as a scoop to feed the birds. The plastic containers meant for pet food were too small for my use, and they are over priced. I bought a large (one that holds 35 -50 lbs. dog food) plastic tub with a snap on cover years ago, and this has worked for me quite well. I am a cat owner with a neat freak boyfriend who prefers that I keep the cat food in those big plastic tubs that you can buy them in, but those cost more money. 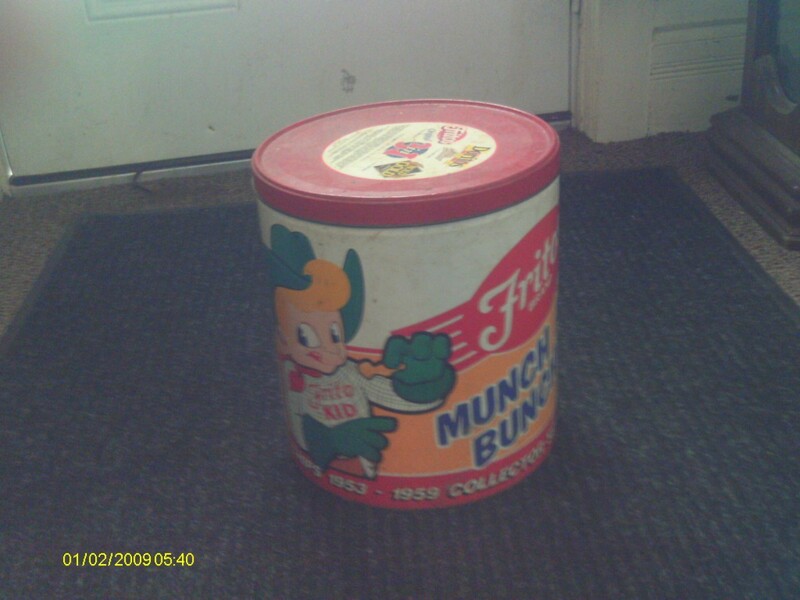 I found this old Frito Lay tin at a garage sale, and since I collect tins I grabbed it up. When I got back home, I found that it was perfect to put my dog or cat food inside, where it stays fresh and the mice and insects cannot get into it. I use the large plastic tub that ice cream would come in for pet food. It has a handle, and you get to enjoy eating the ice cream before using it for storage. I made it fun with the kids. They decorate the tubs with dogs or cats. I use a "dog food only" garbage bin with the locking handles to store 50 lb bags of dog food. The whole bag goes into the bin which is stored in the garage. It keeps the food fresh and keeps the dog out of it. I use a new stainless garbage can. Since he has his own corner with elevated bowls, I keep the can right next to them with a scoop inside. It matches my kitchen and keeps his food fresh. I bought a 5 gallon bucket with a screw-on lid from a local feed supply store. I can put a large bag of dog food in it. We have had racoons come in the dog door and get into dog food bags. This keeps the little devils out. When I buy a big bag of food, I separate it into 1 gallon zip type bags and keep them in a tub. It's easier for me to carry one of these bags to fill bowls as I feed inside and outside. Treats are kept in a mason type jar. We buy kitty litter that comes in buckets with handles. After using the kitty litter, wash out the resealable bucket and store pet food in bucket. Make sure the bucket is dry before putting the pet food in. Store in a cool place. I like to put my pet food in a sturdy, resealable container so that ants and mice don't find a way into it. The larger containers can get a bit cumbersome at times, so my tip would be to get one with rollers. For example, the Suncast 80 qt. rolling bin works great in my kitchen. I am a foster parent for my local no-kill animal shelter. 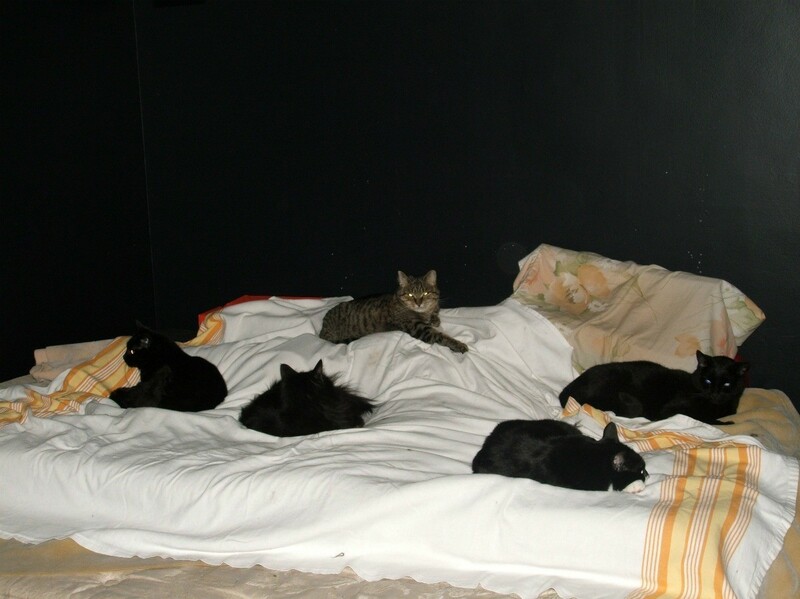 I usually have about 10 cats and the occasional dog in my care. I buy dry kibble pet food in bulk. I divide it into one day servings and store it in the zip lock freezer bags. We have always used dry pet food for our dogs, but find that mice like feasting on it as well. To avoid the mice and keep the food from getting stale we store it in a plastic garbage can with a snug lid. I save all the cat litter buckets to store my dog and cat food. The flip up lid makes it convenient to get the food and they seal well to keep out ants. The handle comes in handy too. We buy large bags of dry dog food. Ants would get in it and sometimes mice would, too. My husband bought a large trash can with a tight fitting lid and we keep it on the carport next to the feeding area for the dogs. I keep all big plastic containers and clean them out to keep my doggie treats and dog food handy and in a cool dry place. I was wondering if a 30 pound bag of dog food will fit into a 5 gallon bucket? The kibble is about the size of a lima bean. It will hold up to 42 pounds of food. Oh my. This reminds me of a math injury I got in high school trying to carry the one (lol). This site says a 5 gallon bucket will hold 35 pounds of Lima bean...so if the food is Lima size, I hope they carried the one better than I did :) that should be your answer. You can also consider a Gamma Seal Lid, for the bucket to be an air tight container. My Cane Corso is 2 and a half years old and has been house trained for over 2 years. She just recently started pooping all over the house just at night when we are sleeping. What would cause her to do that? I would take her to the vet to rule out anything physical. Have there been any changes (new baby, new house) recently? Meeting one of these magestic pups is on my bucket list! First stop for any behavior change with bathroom activities is the vet to rule out a health issue. If the pup gets a clean bill of health, talk to the vet about re-crate training vs talking to a behaviorist. Wishing you and you pup all the best! Look at any changes in her life. Different dog food? Changes in when she gets walked? New pets, visitors? New tensions in the family? Any or all of these things can affect her. If she hasn't been spayed, there is another whole list of possibilities. You really need to count on your Vet to focus in on what may be going on.